Diverse, intergenerational communities. Cohousing communities include people with different ages, backgrounds, family types, racial heritage, religious and political affiliations. By going through the planning, design and decision-making process together, residents form the bonds that provide the foundation for ongoing community. Public participation. Cohousing reaches out to the greater community to attract people to the process. There is no social agenda beyond creating a warm and friendly neighbourhood with the opportunity for more connection with neighbours. Respect and care for community life. The extensive common facilities are designed to create opportunities for spontaneous connection and support the social fabric of the community. Change personal attitudes and practices. A deep sense of connectedness to others can lead to radical realignment of personal priorities. In cohousing, although the individual is respected and valued, community well being is equally important. Such values can broaden into concern for the welfare of those unknown and those yet unborn – which is the essence of sustainability. Democratic self-determination. The members finance the development and decisions are made using 100% consensus. The final product is the result of a shared intention and deeply co-creative process. Equal opportunity for personal self-realization. All members have equal opportunity for participation, leadership roles and access to information. Reduced need for external human resources and infrastructures. In a community where people know their neighbours, there is considerable opportunity for the natural connections and support that reduce the burdens of day to day living. Daycare is often provided collaboratively by the families who need it. The little things that make living independently challenging for elders can be supplied naturally in a cohousing community, reducing the need for outside support. Safety and Security. “Safety is in knowing your neighbours – not in walls and barriers.” – Corporal Dan Kelly RCMP. Resident managed development builds homes “at cost”. Profit that would normally go to a developer stays in the project in the form of better quality finishing, common areas for shared use, environmentally sensitive design and any other features that the resident group may choose to include. Educated purchasers make more sustainable choices. The future residents determine the product so there is a natural opportunity to become educated about the cost benefits of choosing certain options. Knowledgeable purchasers are more likely to choose a higher capital cost now with future savings, thus choosing better quality and more energy efficient alternatives. Access to shared spaces reduces individual home size needs. Workshop, guest room, craft room, meeting room, office, children’s play area, etc. can be shared in common. Individual homes can be smaller when there is easily accessible space available for common use. Access to shared resources allows individuals to decrease material possessions without impacting on quality of life. Because of the social fabric of the community the sharing of computers, printers, fax machines, camping and sports equipment, freezers, tools, and even automobiles are a natural part of daily life. Work at home reduces transportation requirements. Social isolation and infrastructure cost for equipment, common barriers associated with working at home, are no longer applicable in cohousing. Home-based occupations are also supported with advanced telecommunication capabilities. Human resources are more readily accessible in a connected community. Cohousing provides an environment where the exchange of knowledge, skills, expertise and time is a common occurrence. Shared child-care and coordinated running of errands are two examples reducing the demands of daily life. Aging in place is supported. 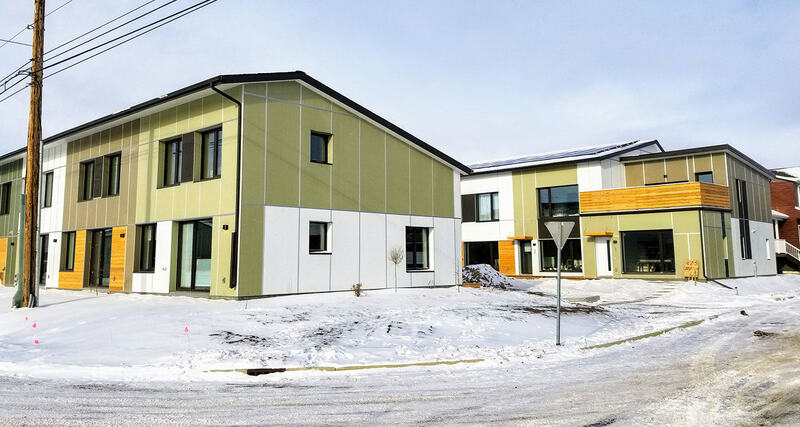 Buildings are designed for aging in place and the social support available in the community allows elders to live on their own longer than in traditional housing. Market demand supports value. Experience has shown that cohousing communities have excellent resale value. People are willing to pay for the added quality and community benefits. Accountability and transparency are an integral part of the process. Decisions are made by 100% consensus. All members have equal access to information and equal responsibility for the decisions that are made. This promotes responsible citizenship and can begin to reduce the tremendous liability issues that our culture faces. Social interaction encourages pro-environmental behaviour. Research has indicated that influence, exchange, cooperation and support all contribute to increased levels of pro-environmental behaviour in cohousing communities. Efficient use of land. Cohousing provides the opportunity for higher-density, yet family oriented socially and sustainable development. Typically sites are chosen within easy access of public transportation and walking distance from many services. Transportation alternatives. Substantial bicycle storage and easy opportunities for car sharing because of the socially connected community have created a documented reduction in automobile ownership and usage. Organic gardening. Wherever possible organic gardening is incorporated, providing the opportunity for a locally generated food source. Native species in the landscaping. This enhances the local ecosystem and requires less maintenance, fewer pesticides and reduced water use. Preserving natural habitat. Where communities have located in areas with more land, care has been taken to preserve as much natural habitat as possible and cluster the housing in order to have a lower impact on the environment. Effective waste and water management. Construction site recycling is typical for new development. In completed communities composting and recycling are taken to another level by including community collection systems for waste that is not typically picked up in the “blue box” program. At Quayside Village gray water recycling has also been incorporated. Rain barrels at Cranberry Commons further reduce demands on potable water supplies. Energy efficiency and use of alternative energy sources. Cost benefit analysis has caused Cranberry Commons members to pay a higher capital cost for an in-floor radiant heating system using an energy efficient boiler augmented with solar hot water panels. Material choice based on analysis of embodied energy and environmental impact. High volume flyash concrete was used at Cranberry Commons, reducing greenhouse gas emissions associated with the production of cement by 50% while providing a constructive use for a waste product from burning coal. About 10% of the wood used for construction at Cranberry Commons was reclaimed timbers, which reduces our impact on the forests and effectively answers concerns about how the wood was harvested. Sharing resources and bulk purchasing. Extensive common facilities shared by the community supports the social fabric, which makes the sharing of resources a daily reality.